This planetary nebula had a faint outer shell that appeared slightly elongated north-south. There was a brighter inner shill with what seemed to be a two-lobed structure that was aligned southeast to northwest. I didn't notice any color. NGC 654 was discovered by Friedrich Wilhelm Herschel in 1790. According to Distances of Planetary Nebula (Phillips+, 2004), this planetary nebula is 1,400 parsecs distant (4,560 light years). The cluster is also catalogued as ESO 560-PN009, PK234+2.1, H IV-64, h 3095, GC 1567, PN G234.8+02.4. This page contains a single entry by Jeremy Perez published on October 27, 2006 2:30 AM. NGC 1647 was the previous entry in this blog. 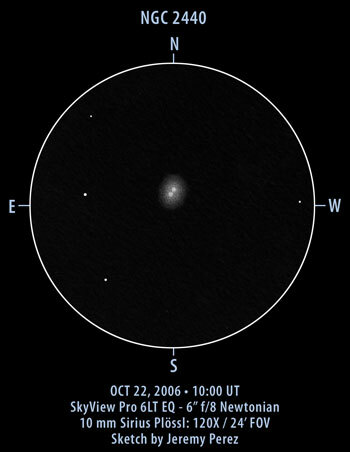 C/2006 M4 (SWAN) - OCT 27, 2006, 03:20 UT is the next entry in this blog.